Develop above layout and form. 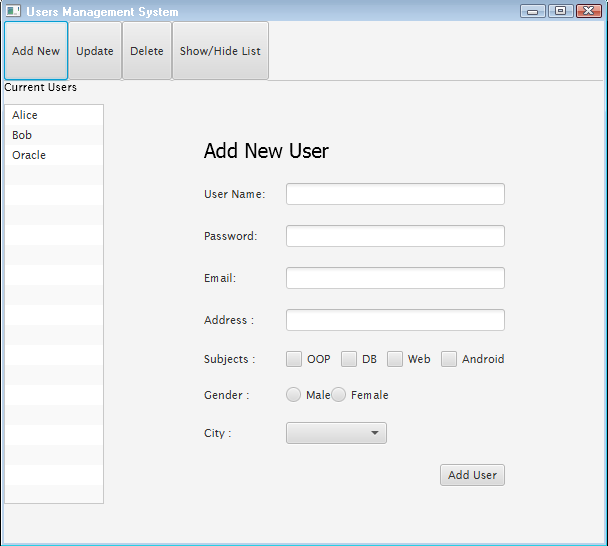 When user fill the form and press Add User button, add new user record in users table as per information filled in the form. Once user is added, update the list shown at lift side. When user click the "Update" button, show a form with an text input field for user ID and a "Show Update Form" button, when user enters user ID in text field and click the button, show same form (you developed in step 1) but it must be already filled as per information in database against the entered user ID. Update the users list on left side, accordingly. When "Delete" button is clicked, show a form with only one input field to get user ID and a "Delete Record" button, when user enters user ID and click the button, delete that record from database. Update the users list accordingly. When user click the "Show / Hide List" button, show or hide users list (including its heading) given at left side. If its already displayed, it should hide, if its in hidden, it should become visible i.e. two different functionalities on a button click. Try to reuse the code as much as possible. Implement database related code in separate class in different methods for CRUD, call those methods from different events handlers.